The US Army is making warheads using 3D printing. Not just ‘normal’ warheads. Due to better design control and use of patterns that could not be used prior to 3D printing, these warheads are deadlier, more efficient and more economical than traditional ones. It’s worrying, yes, but it’s also really, really impressive to see how this technology can be used ANYWHERE and improve the field. The US Army is building deadlier, more efficient, and less costly warheads using 3D-printing technology, according to new reports. While 3D printers have made more headlines for their ability to makehomemade firearms, and for more benevolent uses like the development ofprosthetic arms or facial reconstruction surgery, the Army is planning to use them to print sophisticated warhead components on the cheap, according to Army Technology magazine. “3D printing of warheads will allow us to have better design control and utilize geometries and patterns that previously could not be produced or manufactured,” James Zunino, a researcher at the Armament Research, Engineering and Design Center, told Motherboard. Traditional manufacturing methods are no match for what 3D printers can offer such weapons of mass destruction. 3D-processed components could allow for superior design such as the ability to “pack in additional payloads, sensors, and safety mechanisms,” Motherboard wrote. Weaponry made by 3D printers will also allow the military to engineer more precise specifications on warheads, such as blast radiuses. “Warheads could be designed to meet specific mission requirements whether it is to improve safety to meet an Insensitive Munitions requirement, or it could have tailorable effects, better control, and be scalable to achieve desired lethality,”Zunino said. And while the US Army is attracted to 3D printing’s ability to offer more efficient mechanisms for killing, the cost-effectiveness at a time of budgetary cutbacks is enticing as well. Zunino added that the Army is not likely to stop at mere component manufacturing. “Maybe someday an entire warhead or rocket could be produced as the technology further matures,” Zunino said. 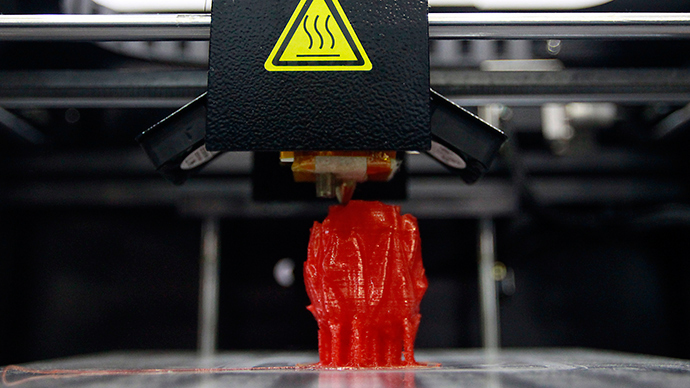 Printing weaponry in 3D doesn’t stop with the Pentagon. Defense giant BAE Systems announced in January that the British Royal Air Force’s Tornado fighter jets have performed their first flights with some onboard metal parts manufactured using 3D-printing technology. BAE has also claimed in recent months that by 2040, aircraft will be able to use 3D printers to self-heal or produce mini-drones during missions using what they called ‘Transformer’ technology.